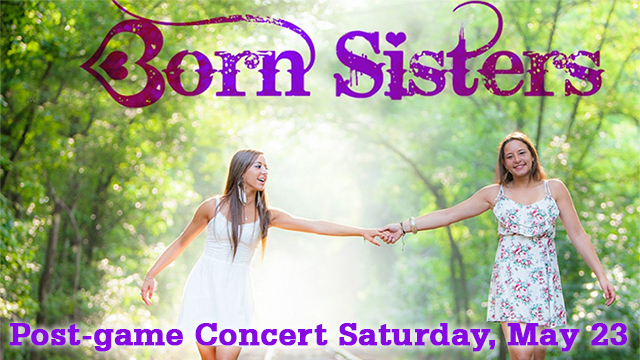 WILMINGTON, DE - The Wilmington Blue Rocks are proud to welcome the Born Sisters to Frawley Stadium for a postgame concert on Saturday, May 23. The show will benefit Ingleside Homes in Wilmington, Delaware, a housing development for low-income seniors. The Born Sisters are a contemporary country music group comprised of Kristen and Kara Zack, who are natives of the First State themselves. Kristen was a graduate of Padua Academy High School here in Wilmington in 2012, while Kara will graduate from Padua at the end of this month. The sisters began their journey by traveling to Nashville, Tennessee during every school break, Christmas, and Easter. These trips gave them the inspiration to try their hand at music and doing what they love: songwriting, singing, and entertaining crowds with the lyrics and music they lived and wrote about. "We gravitate toward this environment because it's part of us as growing artists, and as Padua alumnae, we feel compassion toward this cause which benefits Ingleside Homes low income senior citizens of Delaware," Kristen and Kara said. "It's such a comfort to look out to see familiar faces that have supported us through our journey singing along to our songs and to know that they have also contributed to this wonderful cause. We also thank The Blue Rocks Organization and Ingleside Homes for allowing us this opportunity to help aid this wonderful cause. " The sisters have another show coming up from June 11-14 in Nashville. Their performance will be a part of the Country Music Association Festival at Tavern 96 at the Bridgestone Arena. It was also recently announced that the Born Sisters will be opening up for Country Music star Miranda Lambert on Saturday, June 27, at the Big Barrel Country Music Festival at Dover International Speedway. The group this concert benefits, Ingleside Assisted Living LLC, is a non-profit organization which provides affordable, high-quality, comprehensive services to seniors in the Delaware Valley. This includes retirement living, health care, and community outreach to a diverse population. Services provided are aimed at enabling people to live the fullest possible lives. Ingleside fosters a culture that values and respects staff, volunteers, and those they serve. The show will take place immediately following the Saturday, May 23 home game against the Carolina Mudcats, scheduled for 7:05 p.m. The duo will perform a number of songs from their album "Smarter", and the stage the sisters will perform on will be situated on the third base side.